“The work of the Union cannot be done completely from the Merchandize mart.” Chicago Teachers Union President Karen Lewis told the delegates assembled to learn more about how to do their jobs. There were 100 delegates, most of them attending in exchange for the extra preps periods given to CTU delegates by CPS contract, at the Chicago Teachers Union Delegates Workshop on Thursday, November 29, 2012. The training for that day was held at Teamster City on Chicago's west side. 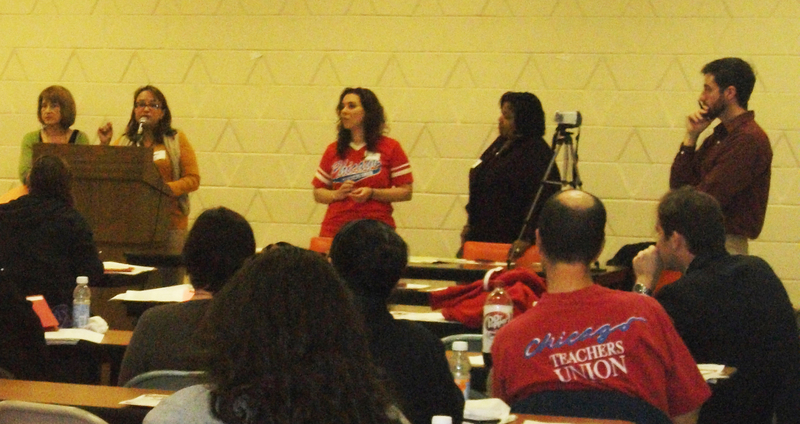 Chicago Teachers Union staff addressed the delegates at the November 29, 2012 training sessions. Substance photo by Jean Schwab.Energy was running high as delegates talked about and worked on enforcing the new contract throughout the system. The delegates also discussed concerns in their schools. Also on the agenda was activity in the state legislature and how we could work to inform legislators about our issues. -- You must work 20 years in order to use sick days when retiring. New sick days: Starting July 2012 and each year following teachers will receive ten sick days and three personal business days. Teachers will be able to accumulate up to a total of 40 sick days in their sick bank. You can use these days to buy up time upon retirement. Every 18 days will be one month. The 3 PB days will be lost if not used by the next December. -- Old sick days are longevity days; all the days accumulated prior to July 2012 will be known as longevity days and can be used for sick leave or when you retire. After 20 days of service, you can “cash” in on that day. -- Family and medical Leave Act (FMLA) is given to any employee that needs a medical or if they are taking care of a member of their immediate family. After ten consecutive days of absence, you must apply for a sick leave. You must have worked 1,250 hours service before applying for a leave and can apply for up to 12 weeks of leave time. You can also apply for an extension of up to 25 months with proper medical documentation. You must return within 10 months in order to return to your school. If you do not return within 10 months, you will be placed on the re-assignment pool. -- There is also a short- term Disability: You will get up to 90 calendar days of paid medical leave. You will use up all 10 days given a year and receive 100% of your salary the first thirty days, 80% the next 30 days and 60% the next 30 days. You may not use this leave to take care of someone else. Debbie Pope (grievance department) and Michael Brunson (CTU recording secretary) reported on PPC (Professional Problems Committee) and PPLC (Personal Problems Leader Committee). Pope stated that “the basis of our power as a union is the Professional Problems Committee.” There must be a minutes taker. Michael Brunson stated that PSRPs need to be represented on this committee. PPLC was created by state law, Open Leaders Act., Brunson said, and must keep minutes. Brunson stated that this committee deals with curriculum and safety. Every school needs both. The PPC can deal with planning a community meeting and creating a working conditions survey. We were reminded to always put requests in writing and ask for a written response. Michael Brunson said that the PPLC has control over ordering books and staff development. Both PPLC and PPC have leverage in lesson plans and money for field trips. The LSC (Local School Council) can also help with money for field trips. Michael Brunson stated that there is no need for an ILT (Illinois Leadership Training) in the building because there are already the PPC and PPLC to deal with the building’s issues. Karl Hubert, from the grievance department, reported what we as staff members need to remember when disciplined. In the past principals would take a small infraction and not warn the employee while stacking them up and then give the employee serous disciplinary actions, the union described. In the new contract there is no "E3," or suspension without pay, and there will be a written warning system If a teacher receives a warning. It will be the first warning and must be in private (not in front of a class) and the second time a warning is given it will be the second warning for the same problem. A principal cannot give a second warning for something that has not been given a first warning. If a staff member is tardy once and then does not hand in their lessons plans; the second warning can not be the lesson plan. It is a separate issue and should be given a first warning. The Principal must present a copy of everything after a conversation with a staff member. Staff members need to take notes. The principal may ask you to agree to a video conference, but only with your permission. You have the right to include the delegate or someone else in the video. Other important new powers were described for the delegates. -- There should be no retaliation for sick days or personal days and you do not have to state why you are taking a personal day. -- If you are asked to substitute during prep, you are entitled to a make up prep. -- Principals must supply a copy of everything. -- Write down any conversation with the principal. You must sign the document but state that you don’t agree. If you get a letter specifying that you have a hearing, you will get an hour to travel to and an hour from the grievance meeting. If you have a problem and can‘t show up to a grievance hearing, call the delegate. You must go to school before the grievance hearing and sign in and come back to the school after the meeting. Delegates-Concerns •	The morale is low and there is high stress. •	New discipline code where student can’t be suspended. The students have a five- day limit and come right back to the classroom and some principals say the police can‘t be called. •	More paperwork and testing. •	Special education teachers spend hours on IEPs, Individual Education Plan, and some take PB days to finish them. • Requesting more staff. •	Removing classes such as AP. •	Special Education and bilingual teachers are being pulled to cover those classes that are without a substitute so the Special Ed and bi-lingual students are not getting services. •	PATs facing high- stakes evaluations. •	PSRPs have to cover recess duty for sometimes 2 hours. •	PSRPs relieving teachers and not getting their breaks. •	Switching PSRPs that have been with the same children for years and giving them a different assignment. •	School starts at 8:15 – so the Teacher Assistants are letting the students in and dismissing them. •	Computers used for school wide testing so computers in labs or library can not be used for other things. Organize and Reach out to the community. The contract has to be enforced in every building.